Sometimes when you're a spinster, you don't even have the energy to try to match your clothes and accessories. Sometimes the weight of the world is just too much to handle, and you just need to cover your body so you can get out the door. For me, that's not "just one of those days." It's pretty much my entire existence. If I could wear a bathrobe to work, I would. It's one piece, and It always matches itself. However, we all live in a world where we need to wear real clothes, and for that, I have a solution! 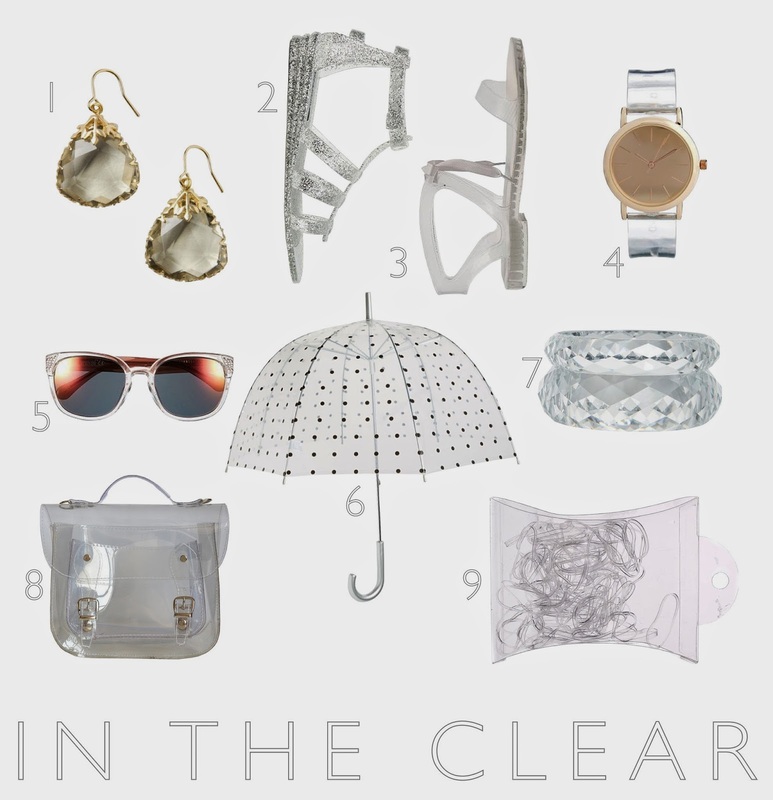 You can't really wear clear clothing to work, but you can snazzy up your potentially ill-conceived (if you're me) outfits with some accessories that will match everything - because they're clear! I can easily see wearing these every single day. They would match absolutely everything, and they're dangly, which for some reason makes me feel like I made a little more effort. Retro with a little sparkle. These are for the spinster with a hint of nostalgia for her childhood. I think these are some pretty fashion forward jelly sandals. Perfect with shorts or a dress. Even if you can't tell time, this makes a great bracelet. Just don't cinch it too tight. It'll make your wrist sweat. Super cute and super on trend. These have both clear and an amber color at the temples. Make sure you don't get caught under this umbrella with someone who has bad breath. They tend to fog easily, but they're just so cute. I do love a bangle. I like these because they're faceted. That way, there's a little extra light reflection and refraction, which makes them seem a little dressier. A jelly satchel is perfect for the spinster with nothing to hide. For those who do have something to hide, there's always a pouch. Bonus points if it's printed with cats. The most practical thing on the list. These are great for a sloppy bun or a little braid, both of which are well-known to be spinster hair styles. So, enjoy shopping these versatile items. It's crystal clear to me that you need them. Happy Wednesday!